Lisburn: Changing Gear at Last? The Masterplan is slowly being implemented. Those markers of civic progress, new pavements, novelty streetlights, shared space and obstacles to the visually impaired are appearing in Lisburn centre. 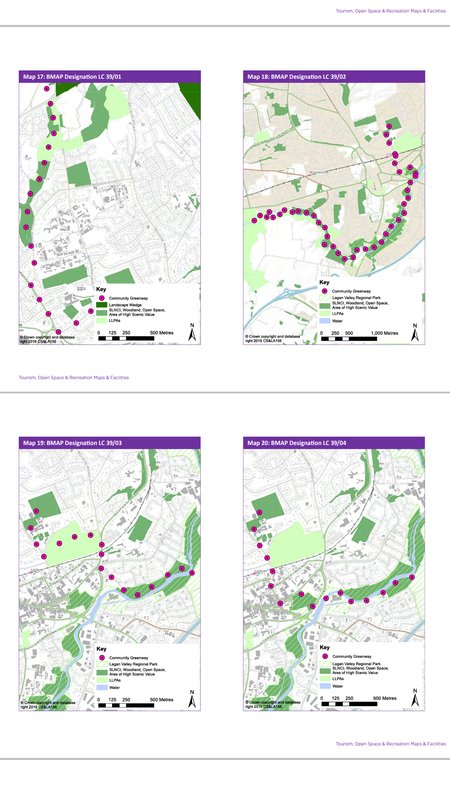 The local plan contains numerous mentions of cycling and greenways. 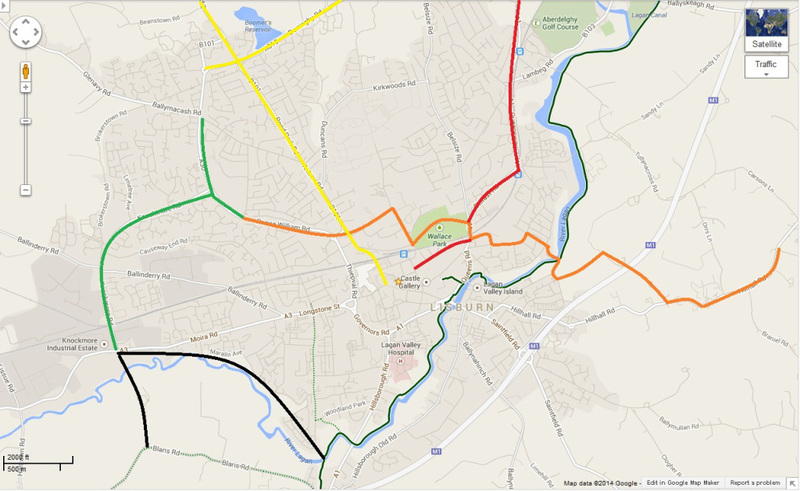 In response to the woefully inadequate cycling provision and the lack of proposals in any of the previous plans for meaningful cycle infrastructure in Lisburn I drew some lines on a map where I thought cycle paths could go in the built up area. Then the BMAP of 2015 and subsequent Local Development Plan were published and I discovered my dreams and the official vision were not much different. I suppose there are only so many permutations realistically possible. In addition to these Community Greenways the new development area to the southwest of Lisburn will be accessible through traffic free cycling and walking routes. What is different about my dreams and their plans is how these paths will look. Lisburn And Castlereagh worryingly talk about walking and cycling in the same breath, as if they are the same thing. And therefore one solution will suit both kinds of road users. And their solution is Community Greenways. I highlighted the poor suitability of the Community Greenways for cycling before, using the Lagan Valley Regional Park to Whiterock route as an example. This meandering footpath appears to have been quietly dropped in favour of an orbital route following the A55 Belfast ring road. Lisburn is blessed with having a nearly completely blank slate when it comes to cycling. There are (segregated) shared use paths along the Lagan and beside Prince William Road and Knockmore Road. In the wider Lisburn and Castlereagh Council area there is also the Dundonald section of the Comber Greenway. And that is, disappointingly, all. As they say in the Netherlands: a good beginning is half the work done. Lisburn can put itself ahead of local authorities elsewhere in Northern Ireland by taking what good there is an extending it into a full network across the urban centres in the council area with space designated for walking and separate space designated for cycling. Cycling is recognised in the Development Plan as a key tool to help achieve its six strategic objectives: Enabling Sustainable Communities and Delivery of New Homes; Driving Sustainable Economic Growth; Growing our City, Town Centres, Retailing and Offices; Promoting Sustainable Tourism, Open Space and Recreation; Supporting Sustainable Transport and Other Infrastructure; Protecting and Enhancing the Built and Natural Environment. There is something contradictory about this objective. The highlighted housing plans in Lisburn West and Carryduff all add to urban sprawl, which induces car dependency and reduces sustainability. Only a few opportunities currently exist to add to Lisburn town centre housing, but encouragingly is not discounted completely. It is crucial these edge of town developments are fully accessible by public transport and have paths to enable cycling and walking. It is crucial sustainable transport is designed into the area’s plans, and not added as an afterthought. The paths for the Lisburn southwesterly expansion follow the river Lagan and skirt the development along the M1 and the Halftown Road. 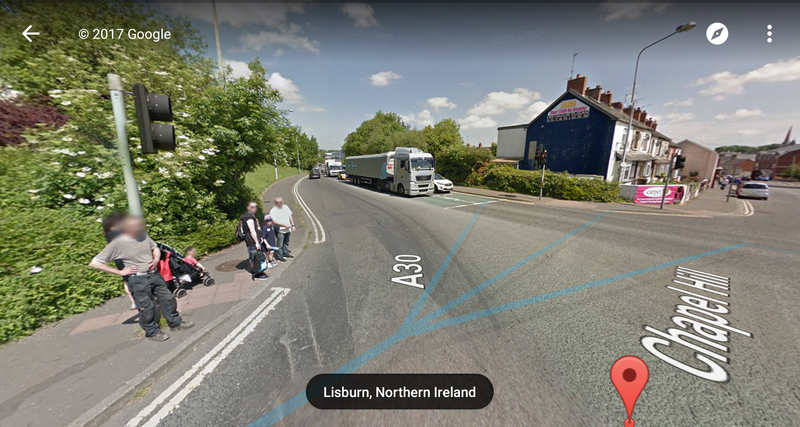 A person using these paths doesn’t find entering Lisburn town centre any easier, because it has a formidable barrier of fast-flowing roads to the west and south: Thiepval Road, Governor’s Road, Laganbank Road and Queen’s Road. To develop Lisburn in a southwesterly direction more needs to be done to allow cyclists and walkers safely across this torrent of traffic. The current beg-button crossings are inadequate for pedestrians. There is little to help the cyclist. Where this ideal of sutainability often falls down is translating them from a lofty planning statement to eventual execution. The Woodbrook development off the Ballinderry Road should serve as a reminder of this, where the economic downturn thwarted NI’s “first eco-village”. The plans for development of housing, or indeed transport infrastructure should be robust enough that in a round of cost-cutting sustainability is not the first casualty. Sustainable travel solution doesn’t just mean finding solutions for work and school related journeys. It also means making the shopping centres accessible for cycling. The new Lisburn West development is only a Motorway’s width away from the Sprucefield shopping complex. It may as well be on another planet. There are existing underpasses which could easily see cycle and footpaths added and so increase accessibility from Lisburn. The town’s healthcare facilities have very poor cycle parking provision, and though there is traffic-free access to Lagan Valley Hospital from the Lagan Towpath more needs to done to allow safe cycling and walking across the nearby Laganbank Road/Hillsborough Road junction. Walking from Lisburn centre (for instance from the bus station) to Lagan Valley Hospital requires three separate beg-button crossings to cross the Laganbank Road. The refuges are very narrow; with railings added it forms a tight squeeze for parents with double prams, people using mobility aids, or cyclists too scared to use the main carriageway. To change its citizens’ travel habits the authorities need to address central failings in its current road infrastructure. It is too car-centred. Nothing in these plans reduces this car-centredness. Lisburn is too easily accessible by car, and it’s retail core is slowly being strangled to death by its noose of roads surrounding it. Encouragement of sustainable travel is doomed to fail if the current road network makes the decision to go by car too easy. 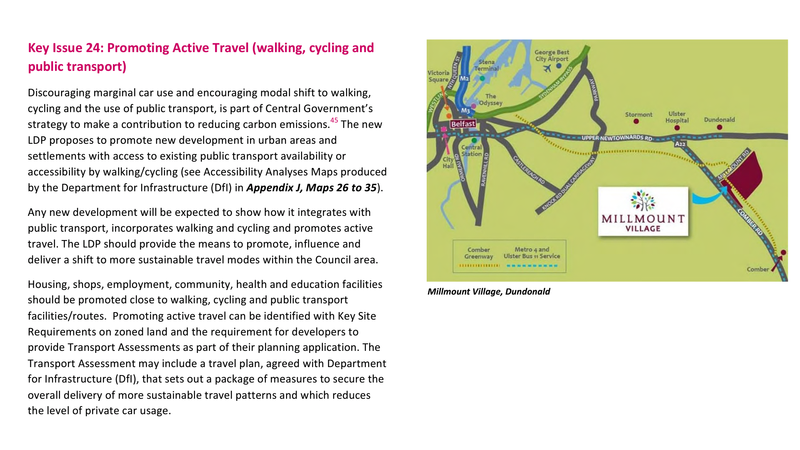 The Plan should enable sustainable travel by building safe designated walking and cycling routes, investing in public transport by (for instance) increasing frequency and density of the network of bus routes. At the same time the use of cars should be actively reduced, by making fewer town centre parking spaces available and removing road space for cars in favour of more sustainable modes of travel. The council continues with its inexplicable intention to promote and use Lisburn Railway Station as a Park and Ride facility. This is inviting traffic into the town centre, but the drivers then go off to Belfast and spend their time and (more importantly) money there. To improve Lisburn centre in terms of congestion, air quality and land use it surely is better to remove this unnecessary traffic to Lisburn West/Knockmore? The Local Development Plan contains a number of “Cross-Cutting Themes”, which are addressed within each objective: Promoting Equality of Opportunity; Enhancing Quality of Life; Strengthening Communities; Supporting Economic Development; Sustaining a Living and Working Countryside; Supporting Good Design and Quality Places; Protecting and Promoting the Natural Environment; Supporting Infrastructure; Climate Change. Rural areas outside Belfast suffer from having very poor connections to centres of employment, schools or amenities such as shops and health centres. The rural areas of Lisburn and Castlereagh are no different, with bus timetables restricted to a few buses a day, aimed primarily at the school run. People who live in these public transport deserts are reliant on private cars for every journey. Therefore this Development Plan will need to address the needs of people who do not drive, or have easy access to a car. Enabling people to cycle to local amenities should be one of the ways to increase equality of opportunity. Practically, this could be assisting people to buy electric assisted bicycles, having a lease scheme. Secure bike stands at principal bus stops and rail halts will help encourage bike-bus or bike-train as a viable alternative to the car. Former Infrastructure Minister Chris Hazzard provided a boost for cycling in committing to the building of Greenways. Lisburn and Castlereagh has committed to the Carryduff Greenway project, but the path is not mentioned in this Plan. The Greenway will run from the Cairnshill Park and Ride to the Lough Moss Centre in Carryduff. It would be good to see this path included. Northern Ireland used to have an extensive network of local railways, which due to their lack of profitability were closed in the ’50s. The Benson Report closed nearly all the remaining lines, leaving the minimalist network we have today. Lisburn and Castlereagh saw the loss of the line to Comber (which became the Comber Greenway) and the line to Dromore and Banbridge, which was largely bulldozed to make way for the A1. The A1 is a route of strategic importance, but totally unsuitable as a cycling route, because it is a dual carriageway expressway. Thought should be given to developing the remnants of the Knockmore to Banbridge line into a Greenway as an alternative to the A1. Certainly in removing the bottleneck around Sprucefield space for cycling should be designed into the plans from the outset to enable cycling access from Lisburn to Sprucefield and on to Hillsborough and beyond. Many important A-roads slice through Lisburn and Castlereagh, fanning out from the urban sprawl of Greater Belfast. These roads have a dreadful road safety record: in the past 4 years 3 cyclists have been killed on Lisburn and Castlereagh roads. To safeguard cyclists and pedestrians all the A-roads should have designated cycle and footpaths beside them, or running closely parallel. 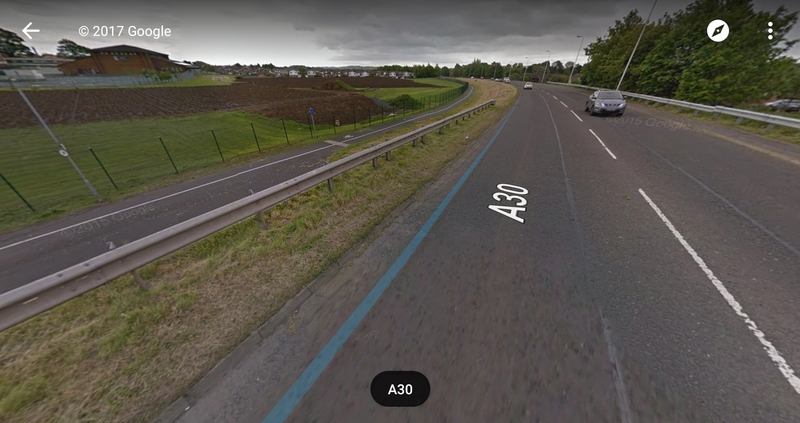 Many of these A-roads have hard shoulders and wide verges, so installation of safe designated cycle paths should not impact on road space or landscape. Addition of safe cycle infrastructure will enable people living in the coutryside to cycle instead of drive, to have better access to bus stops, railway halts and nearby villages and amenities. Using an e-bike will increase the range of amenities people can access without having to use a car. The appendices include maps with travel times for walking, cycling and driving to Lisburn, Forestside, Moira and Carryduff. 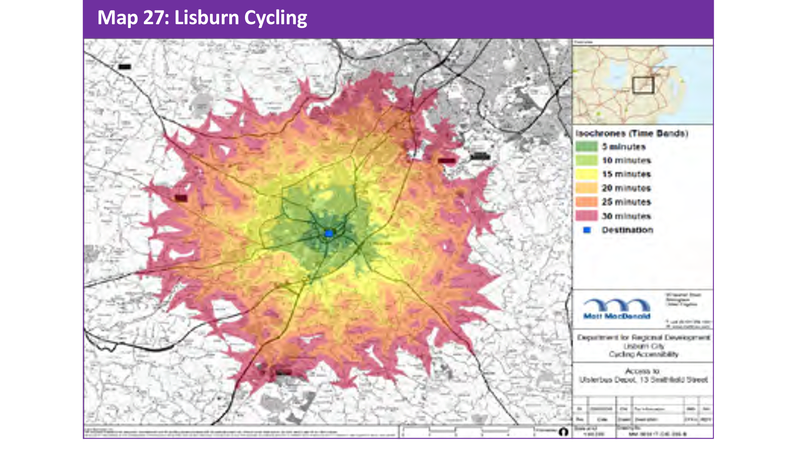 Here, for instance is the cycle map for Lisburn, showing that the entire built up area can be traversed within a leisurely 30 minute ride. Electrically assisted bicycles would greatly increase the distance people of average fitness can cover by bicycle especially in the rolling countryside to the south of Lisburn. A similar analysis for public transport appears to be unavailable in the Plan. This raises the question if beyond the urban area public transport is too sparse to be an alternative to car travel. Investment to increase bus and train frequency is much needed. In the news recently we learnt of the health benefits of cycling. The burden of inactivity on society and the NHS is measured in billions of pounds per year. It is money we can ill afford to spend. 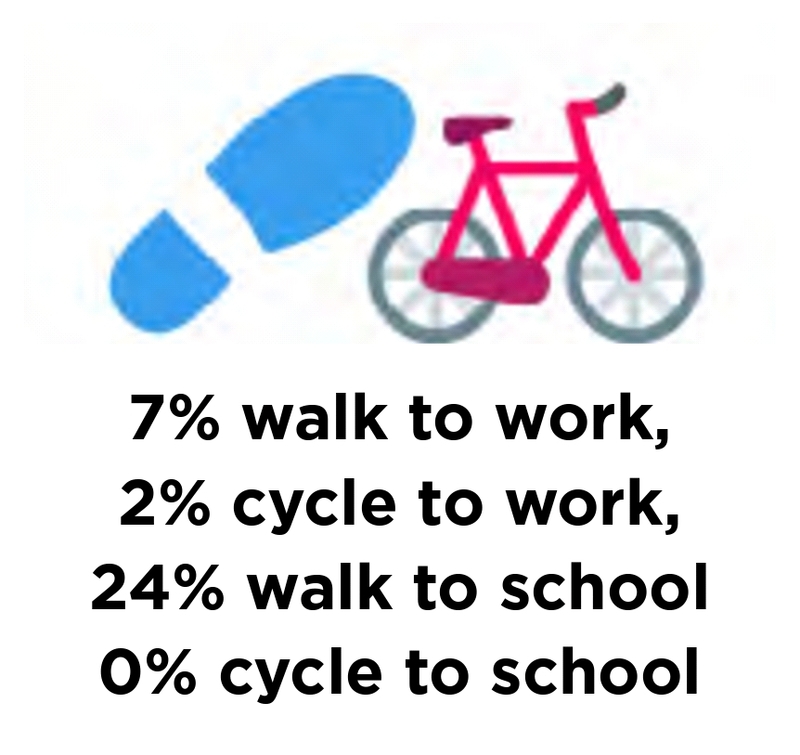 Incorporating and enabling cycling into our urban designs will help people to get and remain healthy. Air pollution is an acute crisis that is killing 1000s of people across the UK prematurely every year. The prevalence of diesel engines and car manufacturers cheating emissions data means we can no longer simply encourage more traffic by building more roads and adding to Greater Belfast’s sprawl. Sprawl encourages car use as people choose or are forced to live far away from their place of work, schools or town centres. 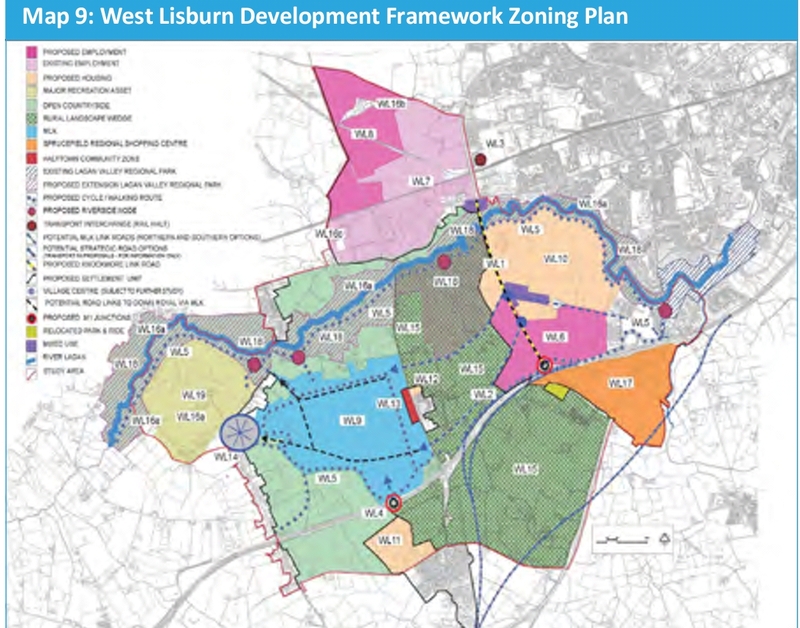 Lisburn has spread and will continue to spread, according to these plans. However, in common with many town and city centres Lisburn’s core is not populated densely at all. Measures should be taken to rationalise the town centre car parks into a couple of multi-storeys and reusing the surface sites for economically more profitable use and housing. Also the large tract of land owned by the MoD to the north of Lisburn’s centre should be carved up for housing and business, before more greenfield sites are developed. One of the great fallacies held in our society is that driving a car is adding to our economy. The money raised through taxes does not cover the outlay needed to enable driving at current levels. More and more people are suggesting road pricing can no longer be avoided. We are paying in our health and environmental budgets for the damage done to our health, environment and society by the utter car-centredness of 20th Century urban development in Northern Ireland. By contrast, cycling has been shown to add to the economy, to be of net benefit. 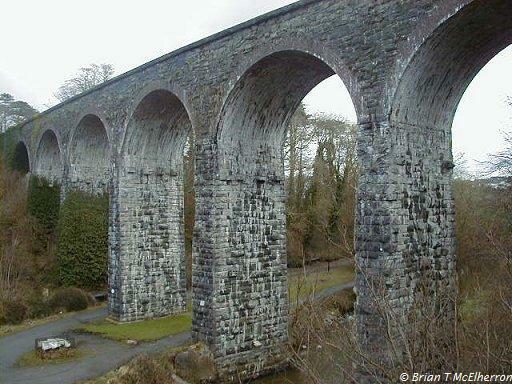 The boost to the economy through building of the Great Western Greenway between Westport to Mulranny in Mayo has added in excess of €7.2 million per year to the local economy. Minister Hazzard was right to encourage Greenways, but cycling’s potential is more than income through tourism. Its benefits are also clear through less congestion, boost for local shops, better health and less environmental damage through NOx emissions, climate changing CO2 and noise. The Plan makes a great deal of Millmount Village on the outskirts of Dundonald, adjacent to the congested A22 to Comber and the Comber Greenway. It is therefore disappointing that the developer and estate agent pay little attention to sustainable travel. The Comber Greenway, which provides a near total traffic free cycle commute to Comber, East Belfast or Belfast city centre, is only mentioned in relation to leisure. The Comber Greenway runs directly past the site. The developer still talks of commuting by car, generously underestimating the time needed to go from Dundonald to the Titanic Quarter. It fails to mention that Titanic Quarter can be reached by a nearly 100% traffic free cycle route. Also missing from the advertising is Dundonald Park and Ride, minutes away from the development. It allows people to get to Belfast City Centre destinations by a Belfast Rapid Transit bendy bus. 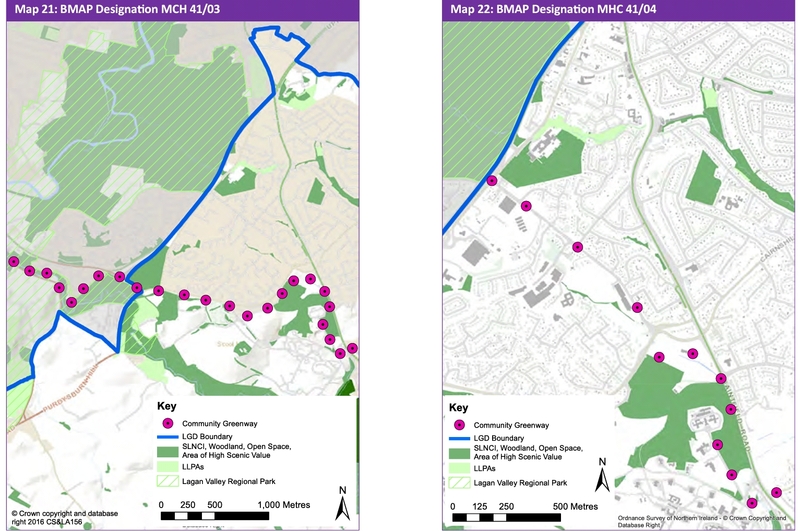 Whilst the Council sets out how Millmount is a shift towards sustainability, in reality the choice to drive is put first, with realistic alternatives not even mentioned. The Development Plan makes clear that growth in Lisburn and Castlereagh cannot be maintained using our current transport models based on private car use. The council is right to point towards more sustainable communities, where cycling is a viable alternative to car use. The council see that its location on one of this island’s key transport corridors could be better used by developing the land to the southwest of the Lagan. However, the spread of Lisburn should be checked and more efforts should be made to develop economically inactive sites within Lisburn centre, reducing surface car parking and putting in its place quality housing. Car use needs to actively reduced by removing town centre parking, increasing accessibility for pedestrians and cyclists to key destinations across the Lisburn area. The council see the benefit of rural Greenways, but fail to include the Carryduff Greenway project, or develop plans for the old Knockmore to Banbridge line to create a safe designated route for cycling between Lisburn, Hillsborough, Dromore and onward to Banbridge, Scarva and the Newry Canal Towpath or towards the southeast through Rathfriland, Castlewellan to Newcastle. Elsewhere more can be done to increase rural utility cycling by developing the use of e-bikes, providing safe designated tracks along the council’s A-road network, installing secure bike racks at key bus stops and railway halts. Money needs to be poured into increasing bus and train services. Away from transport, the Lagan supported a large textile industry powered by water mills. It would be good to see water mills return to provide electricity to the communities along its banks.